A film about saying goodbye. I released the film on the internet, September 10th, 2015, World Suicide Prevention Day. It serves as a tool to spread awareness and create compassion for the mentally ill, suicidal, and addicted people struggling in the world today. The burden that is mental illness which shrouds many of us in darkness is not a death sentence. We must fight each day to stay here. For those who discover this film and are hurting please know that you are not alone. You are loved and you matter more then you could possibly know. If you or someone you know is battling thoughts of suicide, please call 1-800-273-TALK. Nathaniel Carter is a filmmaker and photographer based out of Los Angeles, CA. His deep love of film comes from its power to convey emotion and the multiple creative and technical disciplines it draws from. Nathaniel’s primary focus is directing where he loves to explore the dark, tragic but beautiful things of life. When he isn’t working, Nathaniel is hanging out with his cocker spaniel Stryker, reading books or writing. Andrew Lin has been involved in the arts since as early as he can remember, studying violin and music from his mother at the age of five. He pursued a career in film and media because of the medium’s unique ability to combine elements of all other art disciplines to tell powerful stories. From award-winning short films to marketing and branding videos, Andrew's primary focus as an editor is in telling a great story. With a well-rounded skill set and a critical eye for detail, he is highly effective at doing so for any given client. Daniel Brown is a travel and event photographer based out of Nashville, TN. Having studied advertising and design in college, Daniel has been interested in all things visual from a young age. After photographing musicians and live events for years, he began experimenting with other subjects. Photographing cities within the United States quickly sparked a passion in traveling and landscapes. Crosby Bray is an audio engineer & music composer from the heartland of the America Oklahoma City, Oklahoma. Crosby began playing music early in life, his passion sparking into existence when he discovered the drums. He continues to produce, record and play with a variety of bands always expanding his skills and exploring new sounds. Crosby loves the simple things in life, hanging with his family and friends, exploring and from time to time releasing his inner adrenaline junkie. Colin Bray is a musician and adventurer who loves the chance to make music and explore. He has spent several years touring in the US and abroad. When not recording or spending time with his family Colin is riding or marketing his new surf style longboard line always the boundary pusher. He loves working musically with his brother Crosby, their deep connection to one another fueling the melodic anthems they create. Rebecca Fraiser has been acting since the age of 7 starting in theatre in her hometown of Madison, Mississippi. She moved to Los Angeles in pursuit of a life long dream in acting. She has starred in short and feature films as well as plays, music videos, commercials, voiceover and print ads. Rebecca has a true passion and love for the arts and storytelling with an emotional sensibility to relate to the characters she portrays and writes about. Aside from her career she enjoys spending time in the great outdoors hiking, biking, traveling and donating her time to help others through different charities. A Voyage of Grief is a series of blog posts chronicling my journey across the world as I created the short documentary film For Wanda originally published on Medium here. It had been almost seven years since I last saw my mother. Her twenty year battle with alcoholism, drug addiction, and mental illness had formed a chasm between us. She had made so many efforts to communicate: letters, phone calls from jail, psychiatric wards, and burner cell phones. Many of the letters, I am ashamed to say, I threw out. The phone calls I ignored. My treatment of her only compounded and complicated my grief, adding layer upon layer of guilt and shame. I was so angry with her. I looked at my mom as a deeply selfish person who chose drugs and alcohol over me. I dealt with it all so poorly and with little love in my heart. The ruthless hammer of grief came down hard and swift over the ensuing weeks and months, beating me with the reality that the world is emptier now. The waves of grief came without warning and were onset by the most peculiar of things. I once broke down in the middle of a grocery store checkout line watching a mother stroke the back of her young son’s head. To deal, I would often find solace in booze, drinking until I couldn’t feel anything. It became a nightly ritual to consume a bottle of wine before bed to allow myself to sleep and to fend off the emotional tumult ripping at my mind. The grief was relentless, and was getting worse, poisoning my soul with lies. You could have been a better son. I slipped into a deep depression and it became apparent I needed help. For the first time in my life I began therapy to process and work through my grief, guilt, and shame. I made the decision to stop drinking, began regularly exercising again, re-integrated into life, and began a journey to try to make sense of my heartache. Daniel and I the day before we set out on our journey. I had long talked with an old and dear friend of mine, Daniel Brown, about taking a trip around the world. The way he and I envisioned it was to circle the globe in 30 days, visit several different continents and cultures, focus on seeing wonders of the world, and do some charity work along the way. We coined the phrase “Take A Lap” for our trip and began organizing. Planning the trip provided me a positive outlet — something to look forward to and distract me from my own misery. It was a complicated task because we wanted to do it our own way without travel agents or planned tours. Having the freedom to explore was paramount to our journey. It was during the planning of the trip that I conceived of the idea to make “For Wanda.” It was late at night and I couldn’t sleep. I was at my desk, exhausted and miserable. On my desk sits an altar I built to remember my mom. It was made up of a strange assortment of things: a journal she never got around to writing in, a pair of her reading glasses, a brush with bits of her hair still in it, a Serenity Prayer coin, and the small mason jar of her ashes I took after we had her cremated. Sitting there I was consumed with both sadness and anger. Why did her life have to end this way? Where was the meaning in it all? My mom fought so incredibly hard to stay sober in spite of failing time after time. She would always get back up and try again. For a long time I had run with the narrative that she would overcome her disease, write a book, and positively affect thousands of people’s lives. Distraught over my ruminations of her failure as a mother and mine as a son, I suddenly grew resentful of the jar, the altar, and the pointlessness of my efforts to commemorate her with them. My portion of my mother's ashes. But then something came to me. One of those creative sparks that comes to many of us in moments of self-reflection. I could not undo the past, but I could try to create meaning out of the experience, not only for myself, but also for my family and hopefully for people everywhere. My mother’s life and death were not meaningless, and I was doing her a disservice to keep her to myself in the altar on my desk. She deserved more. I decided then I would take her with me on my trip. I would spread her ashes at seven beautiful locations throughout the world, one place for each year it had been since we’d seen one another. I would capture the experience on film and produce a piece of art to honor my mom, share her story, and if I was lucky, bring some hope to others in desperation. Andrew Lin and I ate the premiere of one of our films Acceptance. I pitched the idea to Daniel and Andrew Lin, a talented editor and close friend with whom I collaborate on projects. They both jumped on board and the development process began in tandem with the planning of the trip. Daniel and our friend Dune Baydoun, a gifted photographer set out at the end of February, our first stop Cambodia. Nothing could prepare me for the wonderful and difficult things before me. Our journey across the globe began in Phnom Penh, a city of chaos and smiles. People get around the city mostly via motos, with one moto often carrying 4 or 5 people. Few stop lights govern foot traffic and the people make their own rules of navigation. Organized chaos. But it seems to work. I imagine it has to do with the people, who are patient and peaceful. Even though their history is marred with the violence of the Killing Fields, the city is awash in a sea of smiles. These contradictions endeared Phnom Penh to me, a city my Western eyes wanted to see as lacking, but whose people welcomed my friends and me as their own. Daniel and I with some of the Habitat for Humanity team. Our purpose in Phnom Penh was a Habitat for Humanity build. Daniel and Dune my traveling partners, wanted to start our journey doing some good. My primary responsibility was that of grunt. I would move materials, fill buckets of sand and mix concrete. It was hot, exhausting and monotonous work. I couldn’t have been happier. There was meaning to what I was doing. My life made sense for the first time in over a year and it ignited love and passion in my heart. Over the course of the week I felt a gradual and positive shift in myself. I felt grateful for my life, the journey I was on and was excited about the mission that lay before me. I would awake each morning in our dingy hotel room, leap out of bed and jump straight into the day. I hadn’t felt this good since before my mother passed 9 months prior. But interrupting these happy moments were flashes of guilt and shame. I was reminded of my mother’s suicide and the role I played in her path to destruction. The voice of pain that tortured my mind since her death returned and reminded me that I was not a good person. That I was broken. You’re excited about spreading your mother’s ashes across the world? The lines between grief and guilt further blurred. It became difficult to discern good from bad. It was maddening, this voice would not leave me alone. It robbed me of my joy and stole moments that were pure and wonderful from me. Celebrating the completion of the house with the Habitat team and the family we built the house for. After a week of hard work we finished the house and everyone celebrated the accomplishment but I couldn’t enjoy the moment. I played the part, acting cheerful and excited at what we had accomplished but I felt empty on the inside. I hated myself. I destroyed the love between my mother and I. I couldn’t stop thinking about it. My rejection of her played a role in her death. How was I supposed to live with this? Daniel, Dune and I said our goodbyes and took a brief flight to our next stop in Cambodia: Siem Reap. We were to visit Angkor Wat, the oldest religious monument in the world and the first place I wanted to spread my mother’s ashes. The Angkor complex is a wondrous and breathtaking place, a complex network of ancient structures dating back 900 years, spread across 500 acres of luscious green forest. Many of these structures are connected to angelic, ethereal white trees that grow out of the temples themselves. The complex is so large we had to rent a taxi for the day in order to navigate the maze of religious shrines. We arrived to Angkor Wat, the central structure, in the late afternoon. This is where I would make the first spreading of my mother’s ashes, but where? We spent several hours walking through the shrine, taking in its beautiful architecture and the intricacies of the walls, awed at the sheer size of it. We climbed to the top and looked out west. We were greeted by a beautiful sunset amidst burgeoning rain clouds. A sea of tourists and monks were exiting the temple as closing time approached. I was running out of time. As we exited the temple, a slow drizzle of rain began to come down. Stronger. Then weaker. Stronger. And then weaker again. And with it came the waves of grief. It was time. I was drawn to the water surrounding Angkor Wat, a force somewhere between sound and silence drew me to its edges. I let Daniel and Dune know where I was headed and they followed, cameras on. At the water’s edge my guilt drove me to my knees. I slowly removed the canister of ashes from my bag and gently unwrapped the faded and torn blue bandana that enveloped it. The bandana was another heirloom, a reminder of a forgotten age when my family was still together. Emotionally shattered, I took off the lid for the first time since the horrible day my sisters and I shared the burden of dividing the ashes up for the family. I got to my feet, struggling to keep myself grounded. I stared into the jar and tried to gather a handful of the ashes. My right hand shook back and forth, hesitant to touch what little I had left of my mother. As I grasped the ashes, a sensation of sand and seashells from a beautiful shore crossed my mind and I was stricken with the reality that my mother was gone forever. I would never fully be able to make amends. I wanted to talk to my mom. I wanted to tell her that I was sorry for the way I treated her. I wanted to give her a hug and kiss her on the cheek and tell her how deeply I loved her. But she was gone and I needed to accept that but how? I spread the ashes from the right and then to the left. I reached back in for one more sliver of my mom’s stardust and squeezed them for dear life. I will love you for all of my life mom. The spreading at Angkor Wat. Photo by Daniel Brown. And I gave the ashes to the wind. The rain suddenly stopped and the sun cracked through the clouds. A sign and one that I needed. For the first time I knew I was doing what I was supposed to do. This is how I was supposed to say goodbye to my mother. This is how I would appease my broken heart. One down. Six to go. Next stop: Vietnam. I left Cambodia feeling more at peace than when I had arrived. The first spreading taught me an important lesson: my grief over my mother’s death would never go away. It would abate, interrupting the day-to-day less and less. But it was always there, under the surface, waiting for the right pressure to be applied, the right button to be pressed, before it would make an appearance. I would need to learn to live with it and in order to do that I would have to show grace, especially to myself. It was at this stage of the journey that three became two. Dune returned to Nashville for work, while Daniel and I made our way to Vietnam, stopping in Hanoi for some Vietnamese coffee and pho. But our true destination was Ha Long Bay, a natural wonder of the world and the second location where I would spread my mother’s ashes. We arrived in Ha Long Bay and boarded a ship called the Dragon Legend. 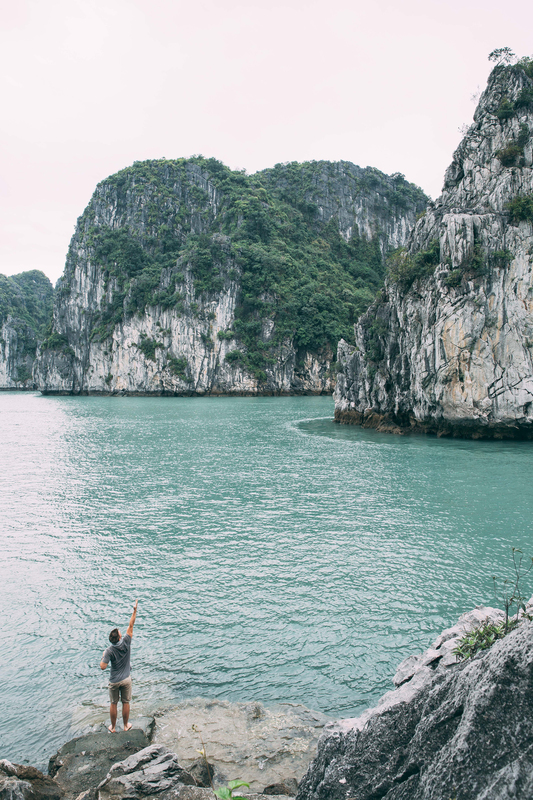 Ha Long Bay is littered with thousands of limestone islands, many of them harboring deep caves. The diversity of the islands was astonishing; some were massive and mountainous, others tiny and thin. We spent the night on the ship. The following morning after breakfast we disembarked from the Dragon Legend to take a tour of one of the islands. A tugboat carried us to the shore and the guests of the Dragon Legend began climbing the limestone steps to a cave hundreds of feet up. Daniel and I split up, cameras in hand, he capturing the impressive island, me searching for a place to spread. Once again, as at Angkor Wat, I was drawn to the water. I descended a set of limestone steps near the entrance to the cave. I found myself in front of the deep cyan water of Ha Long Bay. This was it. The backdrop a set of massive islands covered in green vegetation. I walked down to the water several times while recording to understand and help frame the image. I needed to make sure I got it right. I had to get it right. After several passes Daniel and I were ready. I stepped down, bare feet contacting the cool water of the bay. I felt wonderful. I felt peace. I didn’t need to cry, I accepted the moment unlike I did in Cambodia. It was okay. Everything would be okay. I spread to the right and then to the left as in Cambodia, then a final grasp of ashes once again went to the wind. Three times I gave my mother’s ashes to the bay. I ritualized the experience. One for me. One for her. One for our love. The spreading at Ha Long Bay. Photo by Daniel Brown. The following day we made our return to Hanoi, spending the day with friends we had made aboard the Dragon Legend. The next day we departed Vietnam, our next destination Nepal. This is where things went wrong. First, we were stranded in the Gunghzhao airport in China because of an airplane crash at Tribhuvan International Airport in Kathmandu, Nepal. As we waited for the airport to be cleared, we made the difficult decision to cancel the Nepal portion of the trip and head to Dubai. Nepal was a dream destination for both Daniel and me, and was an important spreading location. We were deeply discouraged and I struggled to accept our change in fortune after our positive beginnings in Cambodia and Vietnam. We were in Dubai two days early, having only arranged a one-day stay. The only item on our agenda was to visit the Burj Khalifa before we would depart for Norway. I had not planned to spread my mother’s ashes in Dubai. Determined to make the best of the situation, Daniel and I decided to journey into the eastern desert and find a spreading location. We agreed a sea of sand dunes would serve as a beautiful backdrop to a spreading. We set out into the desert to find such a place. The desert was bleak and beautiful, but as we drove for hours, we could find nothing suitable. With each passing hour, my discouragement grew and my hopes of finding a place dwindled with the evening sun. The arid climate of the desert mocked me. It was beautiful, but it was also harsh and unfeeling, a metaphor for the current status of our journey. As the sun crept below the western mountains, we turned back. Doubt grew in my mind. The voice returned. The one poisoning me with lies. The one that was trying to convince me my mother’s suicide was my fault. The voice that fueled my grief and shame. I began to question the trip. Would I find seven locations to represent the seven lost years between us? I was afraid I wouldn’t be able to tell the story I wanted to. The mission felt compromised. Attempting to stay resolute, I reassured myself that I didn’t find a place in the desert because it wasn’t supposed to happen here. I needed to look forward. The Dubai leg of the trip was unceremonious and we welcomed our departure to Norway, only to have our misfortunes continue. Our flight to Norway was canceled last minute due to a pilot strike. We spent a night in Finland and our arrival in Oslo was delayed a day. From Oslo we took a train south and along the coast to Stavanger. We rested there and then rented a car to journey to Preikestolen, the snowy mountains that rise high above the Lysefjord; the third spreading place. I was on edge and exhausted. So much had gone wrong over the last five days. I felt a constant sense of foreboding. But my fears were unfounded and were melted away by our hike through the mountains. The crisp, cool weather, rich green trees, and the white snow refreshed my soul and reinvigorated my determination to tell this story. Daniel and I climbed above Preikestolen and headed east, finding a beautiful rock face that jutted high and out offering a breathtaking view of Lysefjord. This was it. We were chasing the sun and had to act quickly. Daniel found his position and angle behind me, I set up to the side. I began my ritual: varying direction but always spreading 3 times… I held the final portion much longer then I had the last two times. The spreading at Preikestolen. Photo by Daniel Brown. A frigid mountain wind swirled around me and I released the ashes high into the air. My arm remained locked stiffly pointed towards the sky and realization echoed through my soul: my mother was there with me, she had been there the whole time. I descended Preikestolen, my soul lighter than on my march to the top. Each ceremony of spreading my mother’s ashes forged meaning and love in my heart. I was freeing myself and uncovering a truth. The voice, the one that had plagued my life since my mother’s death was familiar. I knew it, from my past. It reminded me of a way I once saw the world. Young, alone and in pain I believed that I was the problem, that somehow I deserved only bad things. Daniel and I left Norway in great spirits, excited about our arrival to Iceland. The country is a magical place; vast, otherworldly, and stunningly beautiful, transcending description. We arrived through Reykjavík and made our way south. I could not believe the beauty of this country. Our first stop was to spread at Skogar in front of one of its small waterfalls, which rushed over a deep brown, grass covered rock face. The weather was overcast, and a light drizzle was coming and going. On inspecting the waterfall closer we realized it was possible to climb to the top of a cliff that was directly in front of and connected to the fall. I made my way up, the rushing waters of the falls getting louder as I moved higher and closer to the peak. I reached the top and before me sat an orchestra of nature: rain, rock, and water played in unity, cascading down to a cave and pool below. This was it; the fourth spreading location. I love you mom. I love you now. I love you forever. The spreading at Skogar. Photo by Daniel Brown. A stillness calmed my heart as I released the last handful of ash. I felt no grief, no anger, no guilt, the shame of my mother’s suicide was nowhere to be found. All I felt was love, an unbreakable and eternal love. We completed our first Iceland spreading and spent the remainder of the day exploring. My goal was to find two more places to spread while we were there. At the end of the day we made our way to our bed and breakfast, taking a front row seat to the Aurora Borealis that night. I took the magnificence of the Northern Lights as another sign I was doing the right thing, that this journey would bring about the healing and closure I needed. I looked up to the sky, watched the lights dance back in forth and overcome with emotion, broke into tears. They were not tears of sadness but tears of joy. I felt profound gratitude. What a majestic and beautiful thing to see, what an experience to have. I felt tiny in the universe but it only served to make the universe that much more beautiful. The following morning Daniel and I made the two-hour drive to our next location east, the Skaftafell Glacier. The glacier was enormous, a diverse interconnected system of crystal blue ice. It weaved its way back into the mountains to the north, a trail and cliffs to the west provided a passage to the innards of the glacier. As was now our routine, Daniel split to photograph the area and I went looking for a spreading location. I followed the passage north, the weather frigid and the world quiet but for a slight breeze coming down from the mountain. As I rounded the ridge I laid eyes on a massive boulder jutting out towards the hive of iceberg formations. The fifth spreading location. This spreading was painful. I was diligent with the camera and camera setup. Focused and sharp. I get one shot at this. It has to be right. When I got to the top of the boulder and looked out to the beauty of the glacier emotion took me. The ice looked like waves frozen in time. I couldn’t help but see the similarities, people often telling me, “Grief comes in waves.” Like waves on a shore, grief struck my heart as I tried to say goodbye to my mother at Skaftafell. There we no words, nothing in my mind. I just surrendered to my grief. I reached in to the jar of ashes and readied myself to release the third portion. I couldn’t let them go. I clutched them longer than I had at any previous spreading. It was getting more and more difficult to say goodbye, a frightening realization. With all my heart I finally released the ashes to the wind. The spreading at Skaftafell Glacier. Photo by Daniel Brown. We were hit with snow as we drove back to our bed and breakfast. It poured over us and slowed our return. That night as we lay in bed the wind wailed and sang around the house. I found it comforting, reminding me of Oklahoma, the place of my birth, and the storms that used to soothe me to sleep as a child. But I couldn’t sleep. What was happening to me in all of this? I felt soft and malleable, an imperfect creature begging to be reformed. I could feel myself and my beliefs and view of the world changing fundamentally. The entire way I looked at life was shifting and widening around me. I understood the voice that had been tormenting me since my mother’s death. My grief had given new speech to an old voice born from two decades of living inside the cycle of addiction. This voice shared a message that all was hopeless, all was lost, and that I was no good, undeserving of the good and noble things of life. This is the voice that drove me to spend too many nights in bars and too many days stoned. As I spread each portion of ashes I was learning more and more about this voice. Who it was and the fear it propagated. I was learning how to shut it out and reject the lies it told me. Daniel and I awoke the following day, looked out our window and were surprised to discover much of the snow had melted and the skies were clear. Today would be our final spreading in Iceland. We set out to one of the most southern points of Iceland, a place called Vik. We made our way down to the shore. I’d never seen the Atlantic Ocean before, something else to be grateful for. The weather was overcast but it didn’t take away any of the beauty of the beach and this place. I turned to the east and saw a cliff drawing far into the ocean. My heart dropped. I knew it was the place; the sixth spreading location. We had to get to the location by car. As we pushed up the steep roads to the cliffs above I began to grieve. This would be the final goodbye in Iceland. I was running out of the ashes that had come to signify my mother. I was running out of ways to make it matter. Daniel and I split up. I looked for a way to the end of the cliff that I had seen from the beach. I was torn once more emotionally. As I walked towards the end of the cliff I was gripped with despair. In spite of all the growth and change on this trip it didn’t make me immune to pain. I did not want to let my mother go. I continued walking, the sun shifting in and out of the clouds. I finally reached the end. I radioed Daniel I had found the location. We took steps to get set up. I kept myself composed and we began the ritual. High above the shores of Vik, with three waves of ashes I gave my mother to the wind and said goodbye to her one last time in Iceland. Once more, I held onto the ashes longer and longer, my heart struggling to say goodbye. The spreading at Vik. Photo by Daniel Brown. It was here that Daniel and I had to depart ways. Work and responsibilities called him back to Nashville, one last act of love called me to Israel. I’m forever grateful to my friend and the journey we went on together. A long time ago while pregnant with me, my mother visited Israel. She was on a pilgrimage, learning about her faith as she visited ancient religious sites. She came to the Sea of Galilee, a place my father told me was very special to her. 30 years later I returned to the sea with her ashes, the final place to say goodbye. After arriving in Israel I rented a car and made the two-hour drive north of Jerusalem to the Sea of Galilee. I reached it by late afternoon. I had trouble finding my way down to the water. I was on the east side of the lake and kept running into locked gates and blocked roads. I needed to spread facing the west. It had to be west. I wanted to face the sun as I spread my mother’s ashes one last time. As the sun crept lower in the sky I began to fear. What if I don’t make it to the water in time? What if I miss my opportunity? You have failed. This is all pointless. The voice returned with it’s message of hopelessness. It tried one final time to poison my soul, to make me give up. I would not listen. I finally found my way to the shore and from the water was greeted with a beautiful sunset. There were no more opportunities to say goodbye. I had to film this spreading by myself and I got one shot at it. This was it. Weeks of constant traveling had worn me down. I limped into the water, clutching the last of mom’s ashes. The waves were strong and fought at me as I moved deeper into the sea. I once again began my ritual, the final one. And one final time I lifted the jar high into the air and released all that I had left of my mother. The final spreading at the Sea of Galilee. And it was here, that the voice of my past, the embodiment of death and lies in my life, died. My name is Nathaniel, my father named me and my mother taught me to love. I was born anew from tragedy and forged in the fires of grief, love and the ashes of my beloved mother, Wanda Lynn Carter. I die to the person I once was every day of my life and I live with love branded on my heart. I remember my mother not for her darkness but for all she gave me, and I know, that one day I will see her again. If you or someone you know is battling thoughts of suicide, please call: 1–800–273-TALK.